Today is the birthday of the Mac. And while Steve Jobs may not care about the past, a quarter of a century after its introduction, the paradigms made popular by the original Macintosh (and, arguably, the Lisa before it) are still very much relevant in the present and there’s very little proof that they won’t be in the near future. The original Mac suffered from the same deficiencies so many Macintosh computers suffered over these 25 years since its introduction: low specification hardware (viz. 128KB of RAM), few upgradeability options, a closed ecosystem. Yet it also kickstarted an era of intense innovation and competition, perhaps the golden era of personal computing and marked the beginnings of the Mac’s role in personal computing. While Apple’s focus has drifted away from the Mac as its sole strategic product in recent years, the platform is today as important as healthy as ever. 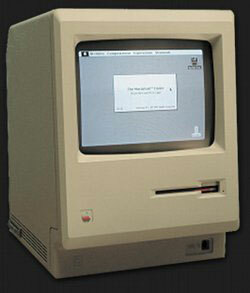 Happy Birthday Macintosh! Image used under the GFDL licence. Originally by Wikipedia user Grm_Wnr.